South Korea has overhauled its public transport network with recharging roads, where the vehicles use power from buried electric strips in the road. 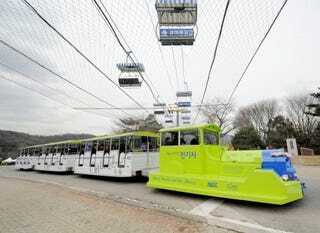 It was invented at the University of California, before South Korea adopted it for an amusement park. The system is being tested at an amusement park in Seoul, but if all goes well, the country hopes to expand it to the whole city's bus route—helping minimize unsightly overhead power lines and obviously doing a good turn for the environment. Dubbed the Online Electric Vehicle system, or OLEV, the magnetic electrical charging strips are buried in four different areas along the 2.2km bus route, with the buses sucking power which can be used to drive or just filling up the battery storage.